The first thing you notice about Norway is how beautiful it is. I mean, really beautiful! Everywhere you look there is another gorgeous, stunning, striking vista. Turn around, and there is another one behind you. After a while, you can hardly take it in anymore. Your brain starts to filter out the beautiful landscapes because, well, you just couldn’t get anything else done if you gave them your full appreciation. Sometimes, however, in the middle of a horse show, I’d glance up and it would strike me again – what a beautiful country! 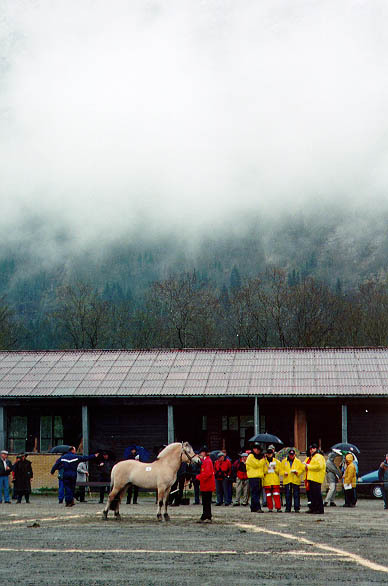 May of 1999 was when we attended the Fjordhorse judges seminar, and stallion and youngstock evaluations in and around Nordfjordeid. We were warned to bring warm and waterproof clothing and footwear, as winter and spring would be struggling for supremacy at that time of year. The expected weather was cold and wet. We were in for a happy surprise. The weather was beautiful, almost perfect. Warm and sunny on every day but one. What luck! We flew into Bergen from Toronto via Amsterdam, where we met up with our friends Julie Will and Darryl Wolford. From Bergen we drove to Førde (the correct pronunciation sounds like Fur-da), which would be the site of the first youngstock evaluation on the next day. This picture shows the view as we drove down into the village of Førde. As we drove through Norway and admired the stunning scenery, I noticed something missing. Where are all the Fjordhorses? It turns out that Norway has very little land available for agriculture. Especially at that time of year they couldn’t afford to turn the horses out, so the Fjordhorses were, for the most part, in the barns. Testament to the Fjord temperament is the fact that they spend so much time confined while retaining their mental health and sanity. Later in the stallion evaluations we would see how important this trait is in the breeding program. Any stallion that exhibited any stable vice (such as cribbing) was immediately dropped from consideration as a breeding stallion. Julie’s friend Bjorn met us in Førde and took us around to several Fjord farms. At this point we had been awake for well over 24 hours but the chance to see Fjordhorses magically revived us. We visited Karl Vie’s farm and got to meet the famous yellow dun mare Faksi, as she was getting a bath for her upcoming role in the Jubilee celebration. What a beautiful typey mare with a gorgeous head and wonderful character. She stood calmly tethered for her bath, and every now and then Karl would feed her a piece of leftover cake. I was able to closely examine her mane while she was wet – no black hairs in there! 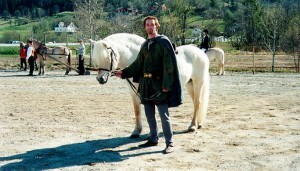 Karl is the head of the Breeder’s Association and a wonderful source of knowledge and information about Fjordhorses. From there we moved on to another farm belonging to a Fjord judge and evaluator. Here we got a chance to see the three-year old grey stallion Siggen (Lisjegråen x Tona – Kvernbu) being prepared for the driving test portion of the stallion evaluation, to be held later in the week. Siggen had been sold provided he was approved. It turned out that he would be approved, and ranked third in quality overall. The third farm we visited was the home of the beautiful stallion Helgfin. Helgfin went on to get the top 8 year old stallion, with scores of 9/9/8/9/9. We also saw his two year old son Knallfin (Helgfin x Tira Torpedo – Eldar) who the next day in Førde received a rosette with scores 8/8/7/7/7. It was most interesting to see the small barns full of stallions – it seemed impossible that yet another horse was being brought out of the barn for our inspection. How did they fit them all in? Absolutely every barn, every farm, and every home we saw was neat, tidy and well maintained. The Norwegians make maximum use of their limited space and everything is kept up impeccably. The horses were also beautifully groomed and in excellent condition. The next day in Førde the weather was cold and raining – as advertised. The beautiful mountains were invisible behind a shroud of fog. On the schedule, there were three two-year old stallions to be presented for evaluation, as well as nine yearling stud colts, nine three-year old mares, nine two-year old mares, and eight yearling fillies. Despite the weather I was in seventh heaven. All these Fjordhorses to look at, examine, and judge. I was particularly interested to see two of the two-year old stallions, who were sons of Felix. The reason for my interest in the Felix offspring was because Felix had been imported to Canada, and I had bred three of my mares to him that year, so I obviously liked him! What became quite obvious during our time in Norway was how prepotent Felix is. We could look at a young horse, and immediately know, “That’s a Felix!” We were quite pleased with how well the Felix offspring were doing in the keurings, and the two two-year old Felix sons that day both received rosettes and placed first and second overall, both scoring an 8 on overall impression. One thing did surprise me. I expected that, since I was in Norway, most every horse I would see would knock my socks off. I think I expected to be blown away by the quality of every horse. Guess what? I wasn’t. In fact, in looking at the youngstock I saw some downright poor animals. Whether this lack of quality in some horses was due to poor care or poor breeding I don’t know. What it did confirm for me, however, is the importance of the keurings, where each animal is held up and judged before the standard. And only those that meet the standard are allowed to go on to reproduce themselves. I did get my socks knocked off by some horses, mind you, but certainly not every one! The next day in Breim was sunny and beautiful and this set the weather tone for the remainder of our time in Norway. Breim had a beautiful facility, there were more horses being presented, and the level of quality in the animals was high. We saw fifteen two-year old stallions, eight yearling stud colts, six three-year old mares, nine two-year old mares, and ten yearling fillies. I particularly liked one of the two-year old stallions, an uls dun son of Sæthersblakken, out of the mare Edna (Ernarson). This horse, Solbjør Borken, (shown here at left) went on to take first in quality at Breim, first at Ålhus, and Best of Show for the youngstock. 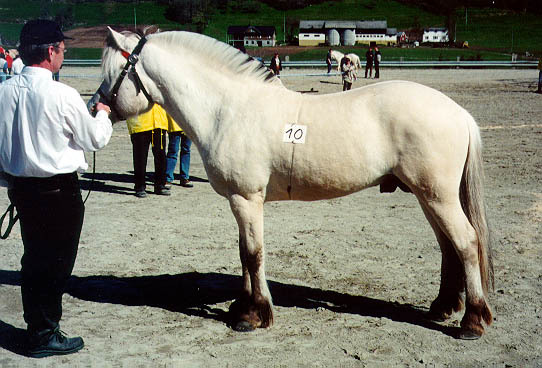 (This horse now stands in Germany after being approved as a breeding stallion in 2000). At Ålhus the next day we had the top horses from both Førde and Breim coming together to be ranked in quality. We were also treated to a jubilee celebration which I found both wonderfully interesting and quite moving. The weather again was warm and sunny, and the facility was next to a beautiful, perfectly calm fjord which reflected the sky and mountain in its still water. 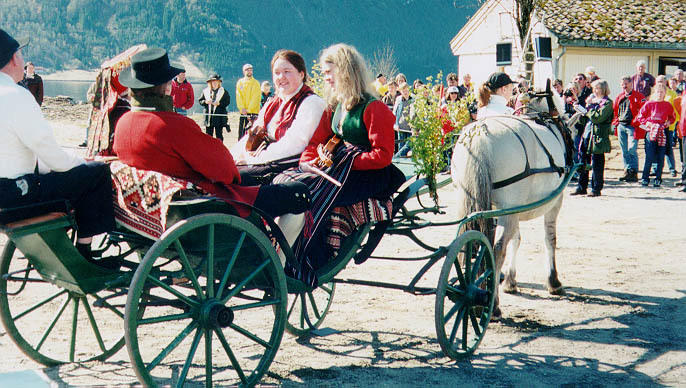 To celebrate the anniversary of the Norges Fjordhestlag, they had brought together a group of Fjordhorses, representing all five colours and the traditional uses which Fjordhorses had served in Norway. There was a horse pulling a wedding party in a carriage, complete with bride, groom, and singing violins. 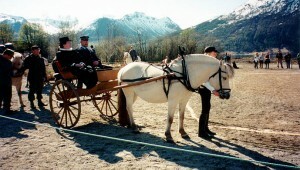 Another fjordhorse pulled the town dignitaries in a Norwegian cart. Another pulled a log, to represent the use of the Fjordhorse in agriculture, and the important role it played in clearing the rocks and stumps from the base of the mountains to open up arable land. 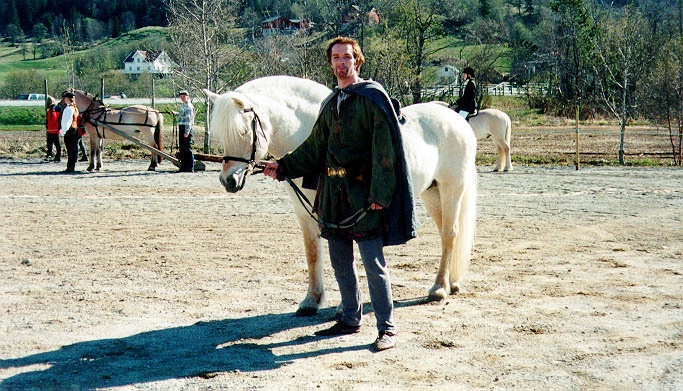 There was a Fjordhorse with military soldiers, a Fjordhorse in modern English riding tack, and finally, the yellow dun Fjordhorse carried a Norse viking who proceeded to give a speech. I was mesmerized by the Viking’s oration, and even though I could not understand one word, I was captivated by the emotion. Later I learned that the speech was in old Norse, and in fact most of those present did not understand it! To me it was a defining moment, by the side of that still and beautiful fjord, to see how much the Fjordhorse meant to the people of Norway. The crowd of people gathered around was both large and diverse. Old people, young people, ladies with children, all manner of people turned out to see and honour the Fjordhorse. Later I asked our host if all these people were involved with horses. He said that, in fact, most of them did not have any day-to-day dealings with horses. They all just liked the Fjordhorse and truly appreciated the contribution that the Fjordhorse had made to the lives of the Norwegian people. On that day I gained a real appreciation of the word culture. I wondered what we have in North America that we can all look to with pride and say “this helped make us what we are today”. After the presentation, Stefan asked the handlers of the five different coloured Fjordhorses to line them all up in a row so he could take a picture. It is not often that you get an opportunity to photograph all five colours of Fjordhorse together in the same place! This photo shows the horses together in the glorious scenery. For more photos of them see our Colours of the Fjordhorse page. The next three days were spent in Nordfjordeid at the stallion evaluations. On the schedule were: four eight-year old stallions, fifteen five-year old stallions who were finishing their six-week station test, and thirty-four three-year old stallions. The level of testing that the stallions are put through is exhaustive. They are evaluated for conformation and movement in hand, free movement, loose jumping, riding, carriage driving, a 1 km trotting test (which must be completed within a prescribed time), and a draft test which is very comprehensive. At each test everything is looked at, such as the stallions temperament when being harnessed and hitched, not just when doing the actual draft work. Stallions are judged for temperament when being handled, and in their stalls. Any stable vice, such as weaving or cribbing, results in that stallion not receiving his breeding license. In the draft test, the stallions had to pull a log through a variety of tight maneuvers after which they were hitched to a large wagon which they had to pull up and over a bridge, then take the wagon up a steep hill and stop halfway up the hill. The stallion had to stand, with loose lines, and hold the load of the wagon on the hill. At the top of the hill they did a figure of eight, then came back down the hill and again stopped partway and hold the weight of the wagon which was pushing on his breeching, while the driver sat with loose lines. At all times the stallions abilities, trainability, and temperament are being scrutinized. 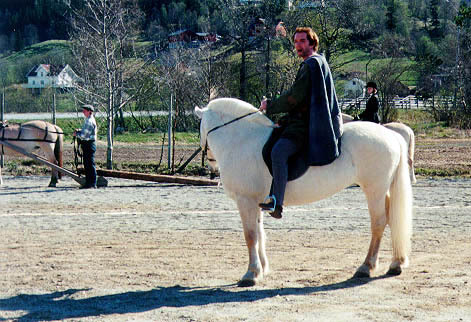 The degree of serious scrutiny and horsemanship that goes into the Norwegian breeding program was inspiring. 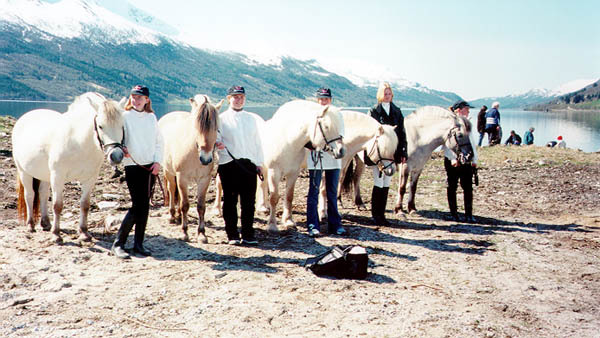 While in Norway, we earned our Diplomas in Fjordhorse Judging from the Norges Fjordhestlag. More importantly, we gained a deeper understanding of the little dun horse that we love so much, and the culture which he came from.